Pay rate will be dependent upon experience. A Taste Of McNally’s Creative and Craftsmanship! We take great pride of our luxury custom homes and owners, but this week’s blog allows us to take a step back to admire our work! Our brief video presentation offers a brief insight into our previous work, along with a glimpse of some of the new designs that will soon grace the prestigious golf courses of Reunion Resort, Orlando. A big thank you to all of our owners, past and future! Searching for a reputable luxury custom home builder? We’d love to help you discuss your next dream home. Our experts are willing to guide you, at no cost to yourselves. Function over style always leads home design! A relationship that has barely altered over the course of the last few thousand years! In a world of constant change, it seems that the details of home design simply ebb and flow. Very little has fundamentally changed through-ought the evolution of home design. Whatever an architect puts down is inevitably ‘temporary’ unless there’s a root, underlying demand for functionality. Without that core need, the designs are nothing more than ‘fads’. Over the last century, the industrialized world has been pressurized into taking home design as an increasingly important science. Land and the availability of space, limitations of energy, water scarcity and a sudden and dramatic shift of workplaces, have all lead to the emergence of a smarter home design. The McNally design team is leading the way with innovative designs and elegant custom homes using the power of functionality. Of course, beauty naturally follows, when our homes work perfectly for the owners and guests! Modern technology releases the power of the kitchen’s importance! Long gone are the days that the family gathered around the TV on an evening. Free from the need to connect through cables, Smart TVs can be installed in any location with a power outlet and decent WIFI connection. Pre-occupied more than ever by our smart phones, the living rooms of yesterday are less used than ever before. Mealtimes however, have always been the anchor point of family life, and well designed kitchens that double up as family and casual dining locations are in hot demand. As teens drift in and out of social media, parents catch up on their emails, the kitchen seems to be the cool spot that offers everyone a chance to achieve what they need. It’s a well known fact that easily accessible food gets consumed more readily. A well stocked refrigerator ensures that kids graze on healthier food, in the presence of others! Repurposed Materials are arriving in style! Reclamation and recycling methods are finally making widening the options in recycled construction. The appeal reaches far beyond the obvious environmental benefits though. New, exciting materials are emerging, and people really want them in their homes. Safe, recycled glass counter tops are not only kid to the planet, they offer a twist on nature’s own work, but with added color! Water Conservation Systems make progress, but humans are the answer! So far, it’s safe to say that the water reclamation cost/benefit ratio just isn’t quite there yet for most homes. As climate change takes effect and population densities rise, there’s more pressure than ever on water supply infrastructures. We read it often, but unless it affects us directly, we never quite grasp the impact that water has on our lives. Some states are feeling the strain on natural resources more than Florida does, but their innovations will benefit everyone at some point. From ‘good practice’ at a personal level, we can make a huge impact upon water consumption. We know that you have read so much about water conservation, but the Central Florida Water Initiative has some really interesting points that may impress even the most knowledgable of us! Space is without doubt the greatest challenge when creating the perfect luxury custom home. Nobody seems to want to ‘reduce’ space! Gone are the days of vast, bland and uninviting rooms. Families require comfort, privacy and flexibility, but always a touch of charm and interest to add a senses of character to any given room. 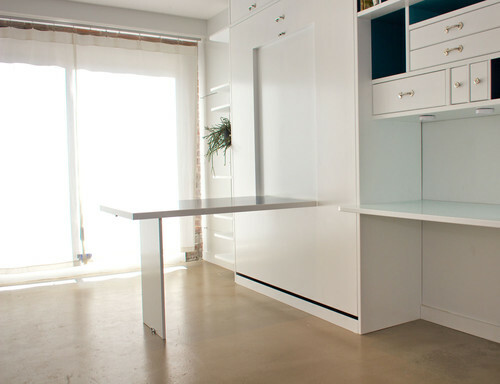 Having spaces that can meet a wide range of needs is essential, and cool features like this foldaway Murphy bed/Office desk are so practical. Making that flexible room space work hard for you, relieves pressure on other rooms within the home! Let us build you that incredible dream home, right here in Central Florida! Whether it’s a luxury vacation rental investment home, or a primary or secondary family residence, our expert team can guide you past any concerns that you may have! The pressure on energy consumption has never been so great and the outlook clearly shows that consumption must be supplied from renewables. Homeowners are receptive to the concept of ‘free’ energy, but the capital costs, and emerging technologies aren’t favorable just yet. Two important factors will ‘push’ renewables; need & affordability. Fuel is still very cheap right now, even though supplies of fossil fuels are tough to extract. The issue however, is that regions like California simply can’t meet demand as population density outstrips the electricity grid’s capacity. Couple that capacity shortfall with increasingly extreme climate change and energy demand trends are set to grow. It’s those ‘energy stressed’ regions that will have no other choice than to drive the demand for realistic renewable energy systems. Not surprisingly, California based pioneers Tesla, are leading the way to an affordable solar solution. As soon as Elon Musk’s team (and competitors) perfect renewable energy products, with longevity, forward compatibility, efficiency and realistic capital costs, the market will rapidly embrace solar energy en mass. Solar Energy and Florida – A Match Made in Heaven? On the face of it, Florida, enjoys an abundance of that gorgeous golden resource. With over 60% of the average yearly daytime delivering solar energy, the Sunshine State boldly wears its nickname with pride. But according to NOAA statistics, Arizona and California really max out with around 90% available sunshine. We can expect those states to rely more on solar as their AC units demand more energy during warmer and warmer yearly average trends. But will solar ever be attractive? The aesthetics of solar panels has left a lot to be desired over the years and many signature communities have strict controls that prevent many of the conventional systems from being used. As the image below indicates, the solar winds of change are a coming! Tesla are on the right path if they can produce solar roof tiles in the required volumes, with assured quality and the right price. Many doubt they will, but their CEO has the drive to make the extraordinary happen! Windermere Custom Homes – Lakes & Luxury Living! Central Florida’s exclusive Windermere shares a lot of quality with its English namesake. Desirable real estate and stunning lakeland views, define two sought after rural destinations, despite a separation of almost 4200 miles. The Floridian version comes with a few added advantages for fans that love great weather and world class entertainment of course! Windermere Fl, offers much more than the obvious, as we try to dig a little deeper into the heart and soul of the region’s top ‘des res’ locations. Lake Butler and Lake Downs offer the largest bodies of water around Windermere Fl, but Lake Bessie (land locked) and Wauseon Bay (access to Lake Butler) offer delightful waterfronts to some prime real estate in the area. With many homes offering easy access to the water, boating enthusiasts are treated to the 11 connected waterways of the Butler Chain of Lakes. Inland waterfront real estate does not come better than this! The beauty of Windermere owes a lot to its stunning natural landscape. Mature oaks bring a touch of romance to this upscale community, often reminding us that money can’t buy what nature so gracefully provides. Most importantly, Windermere is blessed with the presence of neighboring communities such as Isleworth, Keenes Pointe and the Windermere Country Club. Serene, but appropriately active lifestyle! A leisurely drive around the stunning streets of Windermere reveals the heart of the community. An overwhelming sense of wealth and well being. The peaceful ambience is breathtaking, but don’t be disarmed, this is no retirement village! With water-sports, outstanding opportunities to golf and some of the region’s finest schools, Windermere is probably the perfect choice for potential buyers in search of an idyllic luxury home in the heart of Central Florida. Not many communities have an environment that offers a natural barrier to over development. As Central Florida benefits greatly from the lure and economy of the continually growing tourism sector, some communities suffer. Windermere and its immediate neighbors seem to be protected within nature’s own ‘bubble’. The channels, roadways and lakes offer more than beauty however. Over the century, they broke up the area sufficiently enough to prevent any large scale commercial developments, making them just perfect for residential communities.